Welcoming Wednesday with a new and fresh wish..
Bagi para bookish, hari ini adalah hari di mana kita sharing buku-buku idaman. This beguiling story is woven around the life of Fragrant Lotus, who has her feet bound in the supreme Golden Lotus style when she is six years old. Her beautiful feet allow her to marry into a wealthy family, and with steady determination she jockeys her way to head of the household, strategizing through the intricate politics of foot-binding competitions and the turbulent times of the anti-foot-binding movement at the turn of the century. Events in Fragrant Lotus’ life twist and unfold in a series of witty and often wicked ironies, obliterating easy distinctions between kindness and cruelty, the transcendent and the mundane, history and fable, forgery and authentic work. The novel’s waggish narrator exists in the tension between judgment and description, wryly deflating his reader’s certainties along the way. Feng’s engaging storytelling technique effectively undercuts the broad simplifications with which we inevitably approach his novel. The act of foot binding is horrific, but it is also an act of love; the bound foot is a symbol of entrapment and oppression, but it is also an emblem of exquisite beauty and refinement. 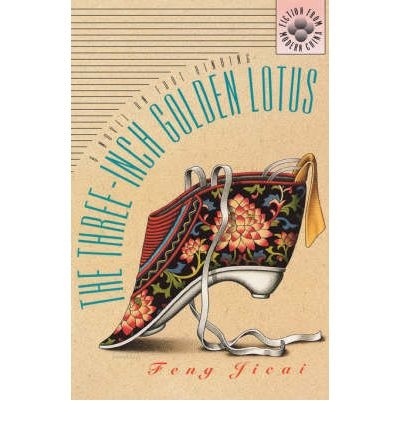 Written in 1985, The Three-Inch Golden Lotus is a deeply affecting, thoroughly enjoyable literary revelation. Gegara membaca novel ‘Explicit Love Story’ yang membahas tentang ukuran kaki, gue jadi teringat dengan buku ini. Selain novel ini, gue juga penasaran dengan karya Lisa See yang beejudul ‘Peony in Love’ yang juga membahas tentang foot-binding. Posted on July 17, 2013, in Uncategorized and tagged bloghop, book, China, culture, Meme, Wishful wednesday, wishlist. Bookmark the permalink. 18 Comments. Makasiiiih. Iya, sama, aku juga seneng baca buku yang bahas kultur. Pertama kali ngeh foot binding dari bukunya Pearl S. Buck. Sepertinya yg ini menarik juga. Semoga segera nemu bukunya. agak ngilu kayaknya kalo baca buku gini yus, meskipun menarik banget emang tema nya.. semoga dapet ya..covernya interesting deh. ga kenal ini buku apaan mbak yuska ._. bwakakaka ukuran kaki, ELS emang kocak banget. covernya unik! Terima kasih banyak mas Tezar. Ngilu ya?